The perspective piece, a response, is written by Victor Clements, a native woodland advisor working in Highland Perthshire. He is an Executive Committee member of the Association of Deer Management Groups, the secretary of Breadalbane Deer Management Group and a past member of the Scottish Environment LINK Deer Task Force. I wanted to make some comments on the article published by David Lintern on 14th January on the current deer debate, Bare Hill of the Hind on the Walk Highlands website, https://www.walkhighlands.co.uk/news/bare-hill-of-the-hind/0015819/. As a native woodland advisor and someone who has practical experience of delivering native woodland regeneration through deer control in Scotland, I wanted to put some of the claims made in a better overall perspective, especially that information relating to native woodlands. We can all have our different opinions on these things of course, and that is fine up to a point, but much of the information and the way that it is presented is highly misleading and cannot go unchallenged. It is neither balanced nor accurate. The SNH deer review report that is quoted is itself riddled with mistakes, figures given without context and it is characterized by a series of sweeping statements that are not backed up by any research conducted. It is a very poor reflection on those responsible for it, and time will quickly show that to be the case. On native woodlands, almost one third of the area is impacted by herbivores across the country. The proportion is the same outwith the main deer areas as within those areas, but because the majority of native woodlands are actually in the lowlands and outwith the main red deer zone, the majority of native woodlands impacted by herbivores are also outwith the main red deer zone. (NB “Herbivores “ are mostly deer and sheep, with the latter totalling 1,461,000 in the Highlands alone, 2015 RESAS). Those areas are also more likely to be impacted by invasive species and non native tree species. If we want to get 60% of our native woodlands in to satisfactory condition by 2020, then 75% of the area which needs restored is outwith the recognized red deer zone. This is the sort of counter intuitive data that you see when you actually study the information available and set aside the spin. I was the author of the recent report quoted in the Press which David Lintern dismisses in his article as a “red herring”. The article was published in the winter edition of Scottish Forestry, and can be accessed here http://www.deer-management.co.uk/wp-content/uploads/2017/01/P24-29-Native-Woodlands-Deer-Scottish-Forestry-Winter-2016.pdf for general interest. All the information presented comes from the Native Woods of Scotland Survey (NWSS), has all been verified independently, and most importantly, it is true. It is not complicated or difficult to understand, but it has been misinterpreted, almost certainly with a particular agenda in mind. My motivation for writing the article, bearing it mind it was researched and written in spring 2016, was to put the threats to our native woodland in a better overall context and perspective. No-one has questioned the overall conclusions arrived at. The article does not suggest that “deer are not the problem”. Indeed, it confirms they impact 112,000 ha of native woodland. What it does suggest, confirmed by the data, is that non native tree species are the biggest threat at 117,000 ha. The order of magnitude is the same, but the latter are more extensive. We are not hearing about that, nor about invasive species which impact c 12,000 ha. Note, non native tree species are not invasive species as David Lintern suggests. Of this latter threat, the clue is in the name. Invasive species spread quickly, and although they may only cover 12,000 ha today, this will increase quickly. At costs of up to £10,000 per ha for clearing rhododendrons on the more difficult sites for example, you can understand why government doesn’t really want to be talking about this. Non native tree species can also be particularly insidious and expensive to manage. The SNH report does not confirm that non native species (or “invasive species”) are the biggest threat to native woodland as David suggests. The report is clear that deer are the biggest threat. This is not true. David says like many others that he “cried foul” on the non native tree/ deer story. I would be interested to know on what basis he did this, whether he knew the wider piece of research existed, and whether he had read it? More widely, the “medium” classification for herbivore impacts will indeed not allow the regeneration of some of the more vulnerable species under some conditions, but this is also affected by ground conditions and stand structure which have an equally important bearing on whether a successful outcome is achieved or not. It does not mean such woodlands are “eaten to the ground”, and the deduction that it is therefore 87% of native woodlands that are affected by deer is pushing the argument too far. “Satisfactory condition” is defined by having herbivore impacts at low or medium levels, and for now, we must accept that and not re- write the rules after the event. I note that David also suggests that birch and pine trees in Scotland “cannot survive in to maturity”. While a very small proportion of native species can be bark stripped by deer, most usually willow and rowan, the vast majority are safe when they grow out of browsing height. The vulnerable time for individual trees is when they are young and not yet secured, and the vulnerable time for a woodland is when trees are over mature and must replace themselves. One weak part of the NWSS report methodology was that while mature woodland areas were identified, over- mature areas were not, and therefore it is not possible to pick out the real priority areas. If we could do that, the report would be more useful. Finally, while figures like 1 or 5 deer per sq km are quoted as suitable deer densities for native tree regeneration, in reality, you have to look at what regeneration is taking place (or not) and make a judgement from there. The right levels will be site specific. Many areas of regenerating woodland can carry surprisingly high numbers of deer, especially when they occupy large areas. Experience teaches you not to quote preferred densities quite so readily. 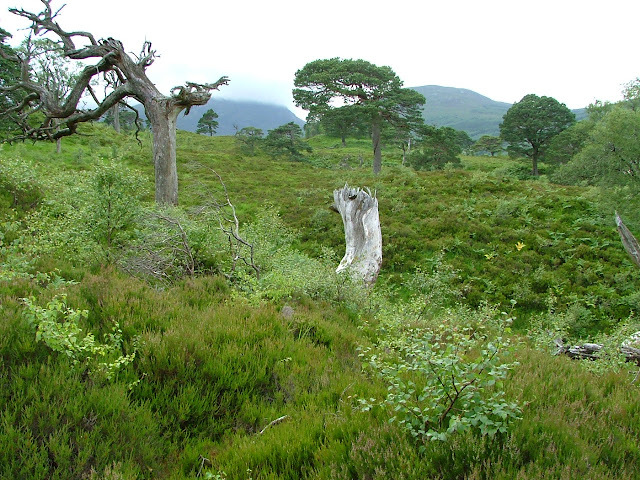 We actually do have a lot of good examples of native woodland expansion by deer control in Scotland, and it is not just the high profile sites like Glen Feshie or Creag Meagaith. We have a wide range of sites under public, NGO and private management in Scotland. The best ones often go under the radar and avoid controversy. We should probably make better use of these sites by promoting them as examples of good practice, especially if that helps to avoid some of the less informed debate on these matters. The annual costs of stock and rabbit fencing decrease towards the end of the period because they were actually bankrupting the agri- environment budget at the time and certain projects had to be curtailed. By contrast, woodland creation schemes have never had to be rationed in recent years, and, by the way, 67% of all native woodland planting 2008- 13 took place in the main deer management group area, along with 75% of all native woodland regeneration. The rest of the country is well behind. This is all essential context to the £4.8 million figure which David is so “shocked” by. If some-one said that we could save the above cost by not keeping livestock and eradicating all rabbits and hares, then that would be considered by most people to be an irrational and impractical suggestion. For some people at least, this is not the case with deer. It is also worth noting that deer fences are almost always erected to keep out livestock as well, and the cost of a livestock fence can be up to two thirds of the cost of a deer fence. It is not therefore the case that we can save 100% of deer fencing costs if there are no or fewer deer. I would like to draw attention to two other figures which have been quoted in Bare Hill of the Hind. Firstly, red deer mortality for stags and hinds in Scotland is estimated by SNH to be 2% after culls have been made, and 6% for calves. This is lower than almost all other species of wildlife in the country, and is indeed arguably less than for humans. This is not “high levels of starvation”. We can have problem years, especially in wet springs, but many other species of wildlife, and indeed livestock, will struggle in such conditions as well. Finally, the huge herd of deer at Caenlochan is spectacular, and no surprise that it is being used as part of this debate. Others have given the reasons why such events can sometimes arise, but the deer density over this wider area is not the 40 per sq km quoted, but 20 per sq km, as evidenced by recent helicopter count data. This figure is just above the target density of 19 per sq km quoted by SNH. This is a high figure, much higher than for most of Scotland, but those are hills which are very fertile. They are underlain by limestone and other base rich rocks, and they can sustain high grazing pressures, especially as there are few sheep there now. Much of the area is designated for species rich grasslands which require high grazing pressure to maintain biodiversity. Montane willow habitats and blanket bogs cannot cope with the high deer densities produced, but this highlights the problem on many of these sites. The grazing pressures needed for some features are completely at odds with the requirements for others, and nobody will choose what the priority is. Until we do that, we will always have this problem. The proposals that deer culls are set annually and agreed by SNH are presented as a modest change, but this is actually statutory deer management, and brings with it all the associated problems of oversight, proper evidence and disputed culls. It is a massive undertaking, and it is less than truthful for people to be suggesting otherwise. We already have a process by which deer groups are assessed against a benchmark which records if they are doing this properly. SNH do not have the capacity to do this on a more formal basis, not even for the 1500- 2000 properties that are currently members of deer management groups. There are up to 55,000 properties in the other 60% of the country. New legislation would have to apply to them as well, and most of them potentially will have deer. It is a fantasy to suggest that SNH might start to advise on deer culls for all these properties. They struggle with their existing workload, and it does not allow for the fact that the vast majority of deer and environmental/ woodland expertise is now found in the private sector in Scotland, not in the agencies themselves, Forest Enterprise Scotland excepted. If David Lintern wants to help estates, their environment and the deer as he says, then we do need to start to see the world as it really is, and we can make a start on that by not spreading statistics and arguments that we know to be misleading. Lets start looking at examples of good practice and build on those. No criticism without recommendation. That will be much more instructive and useful in the long run. We may well live in a post truth world, but we can choose whether we wish to embrace it or not. Much of this current debate and the dodgy deer dossier on which it is based is part of that parallel world which we must all be prepared to call out and face down if necessary. If we don’t, then the social, environmental and economic outcomes in rural Scotland will be poor, and none of us want that.